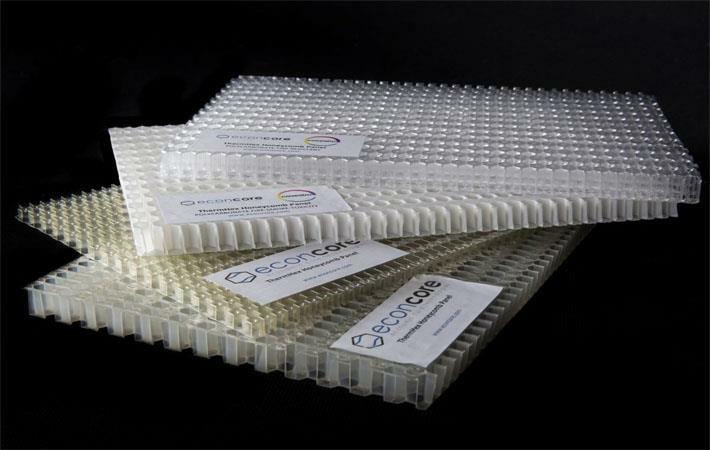 EconCore and Covestro have joined hands to combine their technologies for the purpose of producing strong and lightweight honeycomb panels with outstanding performance. One of the targeted key performance aspects is to comply with fire, smoke, toxicity (FST) requirements for public transportation applications, including railway and aerospace. Covestro has developed and tested a wide range of polycarbonates and -blends with specific grades to meet the FST performance required by railway and aviation applications. Furthermore, the company is currently developing a range of lightweight thermoplastic composite solutions under the brand name Maezio. EconCore has developed and patented a unique manufacturing process to produce ultra-light honeycomb structures in an economic way, with a high variety of material combinations that can be fine-tuned in order to meet customers’ needs. Goal of the two companies’ collaboration is to optimise the FST performance of honeycomb panels in order to meet different application requirements. This shall be achieved by selecting the right combination of polycarbonate grades and composites for the honeycomb core and skin and at the same time adapting the parameters within EconCore’s honeycomb technology. “After succeeding in other application domains, we have decided to address inquiries of the higher end markets. The process has been proven to work very well with a wide range of thermoplastic materials, including these with FST chemistry, while EconCore’s technology has demonstrated its capability of delivering high-performance sandwich panels at high efficiency and cost levels not achievable with conventional methods,” said Tomasz Czarnecki, COO of EconCore.